The former mayor of DC was thrown out of a gay bar. Now the bar’s liquor license has been suspended. 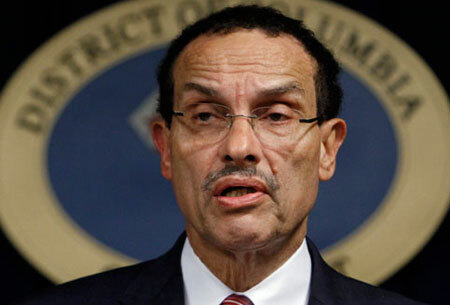 Former mayor and current city councilor Vincent Gray was tossed out of the DC Eagle last year after refusing to show his drivers license to the door person and insisting that his city councilor ID was sufficient for entry. When Gray refused to leave, the bar’s bouncer pushed him out the door and the 75-year-old councilor fell and suffered minor injuries. Now the bar’s liquor license has been suspended for a week after an investigation by D.C. Alcoholic Beverage Control Board (ABRA) and the owners have been fined $2,000 for the incident. The bouncer has been dismissed. “We regret that ABRA has seen it fit to suspend our license for 7 days. During that time, we will not be open to the DC community at large and our employees, many of them residents of Ward 7 and other parts of the District, will not receive pay,” co-owner Ted Clements posted to Facebook. Gray attempted to enter the bar last September for an arts festival event, but the issues started before he hit the door. According to the owners and the bouncer, Gray attempted to park his car in a fire lane and was told to move. He “had an attitude and refused to move his car at first, but later complied,” according to ABRA testimony by the bouncer. When he showed his official city council ID, he was told that since it didn’t include a birthdate, it wasn’t acceptable. Gray angrily asked the bouncer, “Don’t I look old enough?” and grew belligerent when asked to wait outside according ABRA investigators. Security footage shows Gray enter the establishment and put his ID on the counter. After he exchanged words with the bouncer, the ABRA report, the employee started to force Gray out the door. “Councilmember Gray is seen resisting but is forced through the front door,” the report says. The bar will be closed March 23 to March 29. Gray has been a longtime supporter of LGBTQ rights.